The third European Mineralogical Union (EMU) Short Course and Workshop is the first to take place outside of Budapest, Hungary being held in the north German Hansa City of Lubeck. 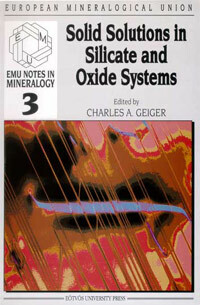 The subject for this third meeting is Solid solutions in oxide and silicate systems. The solid Earth, as well as many meteorites and the other solid planets, consists for the most part of mineral solid solutions. Research on solid solutions is extremely broad encompassing work in physics and chemistry, metallurgy, materials science and, last but not least, mineralogy and petrology. Hence, because the theme is so strongly interdisciplinary in nature, the workshop was organised to include solid state physicists, physical chemists, crystallographers, mineralogists and petrologists. The various chapters reflect some of this diversity and show what mineralogy has become. Experimental investigations in mineralogy now routinely include different types of spectroscopies along with more traditional phase equilibrium, X-ray diffraction, calorimetry, and TEM methods. There have also been new and impressive developments in theory and computation. Many computational approaches relating to the study of solid solutions, for example, the Cluster Variation Method or Monte Carlo simulations, have been brought in from materials science, chemistry and physics. It can be concluded that the traditional or historical, and perhaps artificial, boundaries between the various disciplines are disappearing. Many current research efforts in mineralogy are similar to those in chemistry, materials science and physics. i-xiii + 466 pages. ISBN 963 463 1347.